The banking crisis in 2008 undermined the financial strength of institutions such as banks and insurance companies, and people are now once again concerned about the safety of their savings. The only certain way for investors to achieve security from institutional failure is through a state controlled investor protection regime. Luxembourg stands out among EU Member States with its exceptionally strong culture of investor protection. It has a regime which provides maximum security to investors without limit. The Grand Duchy is in the top 10 financial centers worldwide. It is the second largest investment funds Centrex after the US and the leading private banking Centrex in the Eurozone. It has attracted banks, insurance companies and investment fund promoters from across the world. Many of its institutions specialize in unit linked life assurance, an increasingly popular vehicle for wealth management. It has built a reputation for investor protection, tax certainty, anti money laundering practice and banking confidentiality. Historically many high net worth individuals used offshore financial centers for confidentiality and tax mitigation. However, apart from a lack of regulation and investor protection, they have also been under attack from European and international bodies, with the result that investors who use them are placing their assets at risk for no real or sustainable benefits. In contrast, Luxembourg’s regulations are governed by EU directives that require strict financial controls and supervision to provide investors with a secure onshore regime that still offers tax benefits. Luxembourg was one of the founding members of the European Economic Community (now the European Union). It also participates in the Schengen Group (named after the Luxembourg village of Schengen where the agreements were signed), whose goal is the free movement of citizens among member states. At the same time, the majority of Luxembourgers have consistently believed that European unity makes sense only in the context of a dynamic transatlantic relationship, and thus have traditionally pursued a pro-US foreign policy. Luxembourg is the site of the European Court of Justice, the European Court of Auditors, the Statistical Office of the European Communities (“Eurostat”) and other vital EU organs. The Secretariat of the European Parliament is located in Luxembourg, but the Parliament usually meets in nearby Strasbourg. Luxembourg has especially close trade and financial ties to Belgium and the Netherlands (Benelux), and as a member of the EU it enjoys the advantages of the open European market. As of 2011 Luxembourg was the second richest country in the world, the most important private banking center in the eurozone and Europe’s leading center for reinsurance companies. With $138 billion (February 2012), the country ranks tenth in the world in holdings of U.S. Treasury securities. Luxembourg is ranked 13th in the Heritage Foundation’s Index of Economic Freedom, 24th in the United Nations Human Development Index, and 4th in the Economist Intelligence Unit’s quality of life index. In recent years the Luxembourg government has aimed to attract internet start-ups, with Skype and Amazon being two of the many internet companies that have shifted their regional headquarters to Luxembourg. In April 2009, concern about Luxembourg’s banking secrecy laws, as well as its reputation as a tax haven, led to it being added to a “grey list” of nations with questionable banking arrangements by the G20. In response, the country soon after adopted OECD standards on exchange of information and was subsequently added into the category of ‘jurisdictions that have substantially implemented the internationally agreed tax standard. Luxembourg’s investor protection is unique within Europe. The cornerstone of this regime is the legal requirement that all clients’ assets must be held by an independent custodian bank approved by the State regulator, the Commissariat aux Assurances (CAA). This arrangement involving the CAA, custodian bank and investor’s bank is known as the “Triangle of Security”. The regime ensures that the legal separation of clients’ assets from the account holders company’s shareholders and creditors, so investors are protected from exposure to the company’s credit risk. The account holders company maintains a register of all assets and how they are invested, which is monitored by the CAA. All account holders assets are deposited with a custodian bank. The bank is required to ring-fence clients’ securities (eg investment funds, shares, bonds etc) – i.e. they are off its balance sheet. If the bank fails, these securities remain in segregated client accounts. The bank is bound by the regulator’s legal powers to protect the assets on behalf of investors. 100% of the account holders securities are protected. Cash deposits are not securities and so are not segregated, but cash held in monetary funds is treated as securities and so are protected. Over the years Luxembourg has finely tuned its financial services industry into one offering unparalleled investor protection, client confidentiality and legitimate tax planning opportunities. 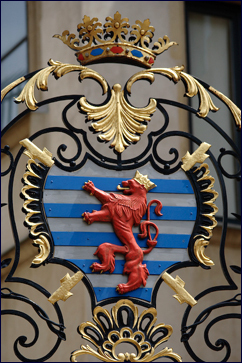 Free no-obligation consultation with a Luxembourg Registered Advisor, available upon request. Agreed! I’ve been telling people this for years. You know what I also love about banking in Lux? It’s really convenient! The banks have state of the art Internet sites! Luxembourg is the new Switzerland!